Today, we're proud to announce a project that's been in the works for a while: A collaboration with Community Pioneer F. Randall Farmer to produce this exclusive white paper - "Five Questions for Selecting an Online Community Platform." Randy is co-host of the Social Media Clarity podcast, a prolific social media innovator, and literally co-wrote the book on Building Web Reputation Systems. We were very excited to bring him on board for this much needed project. While there are numerous books, blogs, and white papers out there to help Community Managers grow and manage their communities, there's no true guide to how to pick the right kind of platform for your community. In this white paper, Randy has developed five key questions that can help determine what platform suits your community best. This platform agnostic guide covers top level content permissions, contributor identity, community size, costs, and infrastructure. It truly is the first guide of its kind and we're delighted to share it with you. Go to the Cultivating Community post to get the paper. While social media were originally focused on consumers, product managers in every segment are wondering how to deal with this shift to customer interaction and communities of interest. We’re crowdsourcing ideas for our B2B products, putting up community self-support sites, and tweeting our updates. We surf user-generated content on Facebook and LinkedIn. Anonymous posts rate our products against the competition. Customer groups that love us - and hate us - are organizing on their own. Hidden in social media are problems of web reputation: how to tell good stuff from bad, how to engage and reward contributors, scale up rating systems, and stamp out inappropriate content. Web reputations are a source of social power. As product managers, we need to understand the reputation and reward systems we put in place when we add social networking to our products/services. This talk with provide you with the sample criteria you must think about when creating a social media strategy for your product.It will identify the five most common mistakes product designers and product managers make when considering adding reputation, ratings and reviews to their applications It will provide you with intellectual tools needed to avoid these pitfalls as well as teach you how to think effectively about the alternatives. For example, questions like “Is Like always better than Ratings?” “When should I use thumbs-down?” and “Can I re-purpose reputation?” will be discussed. It will be a variant of the Reputation Missteps talk - targeted at product managers. Non-members can attend for a nominal fee. This article will be updated with a registration link when it becomes available. The slides from our presentation yesterday at the Web 2.0 Expo in San Francisco. We will soon be adding all speaker's notes into the full version on Slideshare. View more presentations from Bryce Glass. It's Reputation Wednesday again, and the entire subject area of reputation systems seems to be heating up. For example there's been a lot of chatter about Unvarnished . Unvarnished is a public karma system for real-world identities which will reportedly accept [and protect] negative anonymous comments, presumably from former co-workers. Today, Unvarnished makes its beta debut. It’s essentially Yelp for LinkedIn: any user can create an online profile for a professional and submit anonymous reviews. You can claim your profile, but unlike LinkedIn, you have to accept every post, warts and all. And once the profile is up there’s no taking it down. ...and... CNet's Molly Wood writes in Unvarnished: Person reviews or trollfest? Because let's be clear. Though Unvarnished may be billed as a natural extension of trends that started with LinkedIn, Yelp, and even Facebook, MySpace, and message boards, there's nothing about this site that, in my opinion, doesn't lead almost immediately to rank nastiness. After a long conversation with co-founder Peter Kazanjy, formerly of VMWare, I'm convinced that the founders (the others come from eBay and LinkedIn) really do think they're creating a site that will maintain a professional veneer, be well moderated by its users, and won't descend into personal attacks. I just don't agree. The most prominent experiment in directly measuring trust is Unvarnished, very recently launched in beta form. You rate what trust you have in specific individuals, and they might rate you. Unvarnished is pretty controversial, and is already attracting a lot of legal speculation. They're trying to address all the problems related to the trustworthiness of the information they receive, and if so, might become very successful. We said it there best: "Avoid negative public karma, really." The reason for using indirect input is to establish a clear context of evaluation - eBay requires you complete a transaction in their system before you rate a seller. There is no way for unvarnished to tie the negative comments to an actual context (co-worker). There is a real problem with the incentives model for all the participants (we spend one half a chapter on incentives and motivation for user generated content). As we warn there, mixing ego-based motivation (i.e. revenge) with commercial incentives (personal brand building) is usually toxic. Unvarnished is especially problematic with the ability to leave anonymous comments. Doesn't anyone remember F*ckedCompany.com? Having been the target of comments like "Sieg Heil, Randy!" I can tell you one possible outcome for Unvarnished: Deadpool. Scanning our post summarizing Karma best practices suggests quite a few places Unvarnished might want to look at closely when creating and displaying their karma. A colleague that worked for Wink.com, an identity aggregation site told me that they would get people angry at the fact that a profile had been assembled on their behalf on Wink, even if it was only built by a search engine—they would often demand it's removal, even though it only contained public data. Identity and privacy are sensitive topics. The one thing I'm sure of, from my experience building online communities for over 35 years, the founders of Unvarnished will discover that the use-patterns will look nothing like what they've planned for or predicted. They have bitten off something in an area that is fraught with peril, and so far (in the press, at least) haven't shown any understanding how significantly different business reviews are from public user karma, especially when people's livelihoods are at stake. How can a website attract the contributors it needs? Key Decision #1: What are the key business objectives of your reputation system? Key decision #2: What information should be included in your user’s reputation profile? Which actions are most relevant to the reputation system’s users? Which user behaviors are desirable? For which behaviors is it possible to obtain reliable information? Key Decision #3: How should reputation information be aggregated and displayed? Raw activity statistics. Examples: number of reviews posted, number of transactions completed. Scores and distinctions. Examples: star ratings (such as Amazon reviews), numerical scores (eBay’s feedback score, TopCoder’s user rating), numbered levels or named member tiers (World of Warcraft’s player levels, Slashdot’s “moderator” and “meta-moderator” tiers) or achievement badges (eBay power seller, Amazon Top Reviewer). Leaderboards and other methods of displaying relative user rankings. Examples: the list of top Amazon reviewers; Epinions’ author popularity ranking. We've guest posted over at CommunityGuy.com outlining a content-quality scale. Content at the higher end of the scale should be rewarded, trumpeted, and showcased. Stuff on the lower registers will either be ignored, hidden or reported to the authorities. If you're asking for explicit user opinions in your reputation system (ratings, reviews or even just a simple “Like”), pay special attention to exactly when you are asking for them. You'll get better data if you try to gather opinions when it makes most sense to do so: try to find the sensical moments to solicit user input. Can you make it too easy for users to give reviews? You may not think so—if you're in the early stages of deploying your reputation system (or building your site), then you're probably more worried about getting people to use the system at all. And putting obstacles in front of potential reviewers certainly doesn't sound like a good way to alleviate those fears. But, long-term, the success of your reputation system will depend on quality, honest and unbiased opinions. It may well be in your best interest to limit those who can, and cannot, give ratings. Require that users register, at least. Plain and simple. It should be the bare minimum level of investment that a user should make to voice an opinion on your site. You may want to go even further. Yahoo! Answers, for instance, limits certain functions (rating questions & answers) to only those users who've achieved a certain status (Level 2) on the site. Recommendation: Make it easy, but not too easy, for users to give an opinion. Bake in some degree of accountability and ownership for publicly stated opinions. And even Apple has fallen victim to this oversight. Early iterations of the App Store rating system allowed for anyone to rate an iPhone app—whether they'd ever actually installed the app or not! This violates the "sufficient investment" principle, above, but it also seriously calls into question those reviewers' qualification to review. There's simply no way those ratings could have carried any real value—the reviewers weren't making informed decisions. Apple eventually fixed this oversight. Now, you're given the opportunity to rate any app from the App Store interface, but when you try to do so for an app you've never tried? Recommendation: Place ratings inputs either spatially or temporally downstream of the act of consumption. Although Apple addressed that problem, they also introduced a new one. 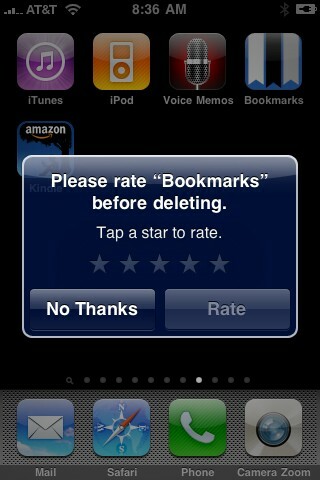 Now, when iPhone users attempt to delete an app from their device, they are asked to first rate the app. This is, of course, a horrible time to ask a user to rate an application. After they've made the decision that they no longer need the app and just as they're in the process of deleting it. Even an app that a user loved may fare poorly under these circumstances. Perhaps it's truly a horrible app—in which case a bad rating would be justified— or perhaps the user just no longer has any use for it. (Maybe it's a game that he or she has already beaten, or a Twitter client made superfluous by a newer, sexier alternative.) By the time a user is uninstalling an iPhone app, the love affair with that app—if there ever was one—is unmistakably on the wane, and the average ratings likely reflect that fact. Recommendation: Don't ask for ratings at the low-point of a user's relationship to the rated object. True, there is a "No Thanks" button, but its meaning is ambiguous and some reviewers may mistake its intent (perhaps reading it as a "Cancel this deletion" action instead.) It is hard for users to give honest and considered opinions when they are still caught up in the experience that you're asking them to evaluate. Recommendation: Respect the primary tasks that a user may be engaged in on your site. Don't interrupt them unnecessarily in order to solicit ratings. Special thanks to Laurent Stanevich for providing the iPhone app rating screenshot.